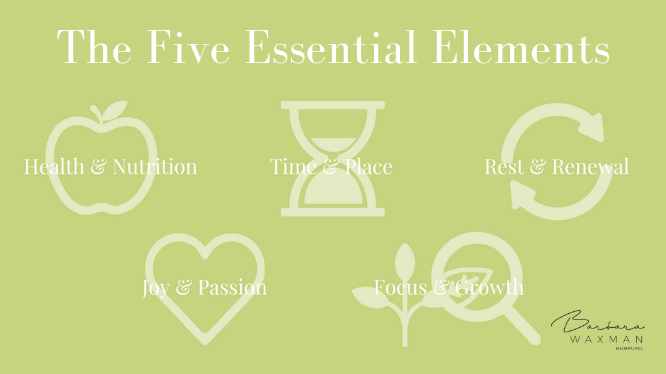 There are Five Essential Elements you need to activate in order to thrive and to show up as your best and most effective self, at home and at work. It was 2011 and my friend Lisa looked me in the eye and told me in no uncertain terms that what I timidly shared with her was not normal. I felt well beyond my chronological years but hid it well. When I worked at a conference, always an all-out marathon, I’d get a room in the building so I could rest for a few minutes during the day, I had just explained. I dreaded travel with a time change because I didn’t feel resilient enough to deal with it well. How long had I felt like this, she asked. At least a few years, I responded, with that queasy combination of embarrassment and self-pity. Why couldn’t I figure out how to manage my energy in a way that kicked my mojo into gear consistently throughout the day? How could I be so exhausted yet not be able to sleep soundly? I had gone for my annual check-ups. My highly regarded doctor, who was younger than I, by the way, looked over my lab reports and told me she wouldn’t have energy to live my life either. She went on to say that everything looked normal and that I just needed more rest. I didn’t want to sound like a complainer so I tried to soldier on. I didn’t trust myself. Until Lisa insisted that what I felt was not normal and that I needed to hunt down the answer. She told me to start with an endocrinologist. Thank goodness for pushy friends! Dr. Buxton walked into his office, strode over to shake my hand, took a good look at me and announced: you have a goiter. Memories of women on the pages of the National Geographics of my youth came to mind. You remember those, don’t you? They had goiters the size of a large grapefruit coming out of their neck; I felt exposed. And I felt truly seen and relieved. I received a prescription for what I called my “magic pills.” Magic because after years and years of suffering in embarrassed silence, I finally knew how to make it through the day without the hurt of total exhaustion. The science had been available to me all the time but I didn’t invest in myself enough to keep searching for an answer. I knew the truth — if it had been a loved one feeling the way I had felt there was no question that I would have figured this out soon. Over the last decade, largely as a result of that experience, I have taken a deep dive into both the science and the art of how to enjoy a life well lived. A life replete with the mojo you crave. I’ve learned that while you can appear to have all of the outward trappings of success, it’s still possible to feel like a failure. Despite our best efforts to feel happy, energized, and engaged in life, we can still feel empty inside. Oftentimes at the beginning of the year we emerge from our resolution cocoon ready to charge ahead — demanding more of this and less of that. But maybe what we really need to is to reconnect with the part of ourselves that doesn’t just add more rocket fuel to our fire, it lets us take off in the direction of our dreams. Our most valuable currency in life is our energy. To kick-off 2019 I’m thrilled to officially launch what this past decade of study has taught me. Your success has everything to do with a structured investment in yourself that is focused on producing the extraordinary results you crave. That can be as humble as feeding your family and keeping a roof over your heads, or as outrageous as wanting to change the course of your country by running for public office. So kick out of your resolution cocoon that has been shown to bring people down more than anything, and kick into the year with the Five Essential Elements quiz as a jumpstart. There are Five Essential Elements you need to activate in order to thrive and to show up as your best and most effective self, at home and at work. By learning and using the five essential elements you’ll find that your chronological age takes a back seat to the stage of life you’re in. For the next five months, each of my News You Can Use letters to you will dive deep into one of the Five Essential Elements. My hope is that you will join me on this journey to renew your life and energize it with the potential you have inside. 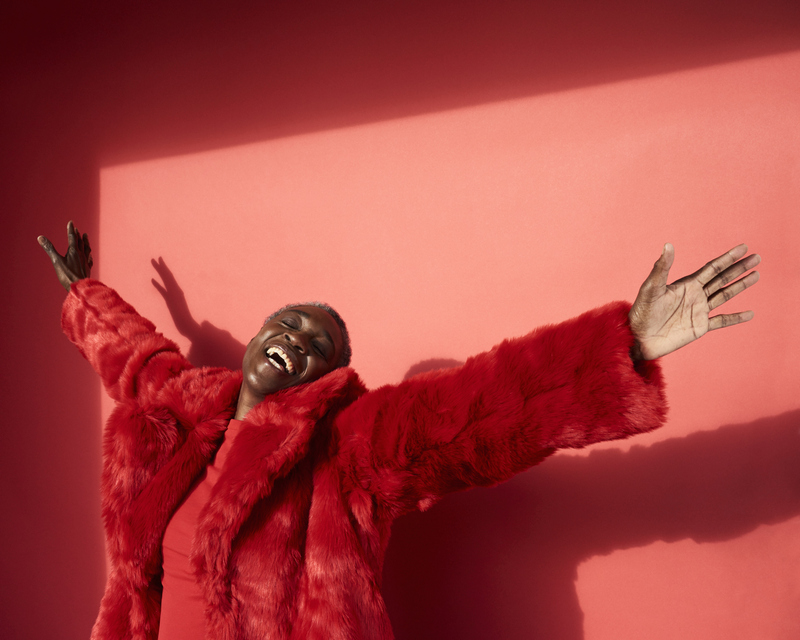 Sign up for News You Can Use, my blessedly infrequent newsletter, where you can also take The Thriving Quiz for free to assess your energy and take the first steps to live your best 2019.